A bit ago, a house in our neighborhood got a new deck. Their old deck wasn’t so old, and yet was left completely disassembled on the curb for pick-up. Well, DH didn’t mind lending a hand to the collection crew that week and picked it up. What does one do with old decking? Apparently, so many things. You set up a work station in the beautiful weather. You might even unmake my unsightly “compost bin” (also known as “that ring of fencing in the middle of the backyard held in place by two stumps.”) No worries. I can reuse the fencing as trellis later in the season. And even turn the compost, fill the bin, water it, and top it with leaves! I often say aloud in the real world how very lucky and spoiled I am, and I do mean it. In so many ways, I am spoiled rotten and ever so grateful for DH. Breaking summer ground for fall. I grew beans in this bed in March and April. I gave some new squash varieties a go as well as took my first real stab at some melon. It was all done by June. Had I planned better, I would have had some more pepper starts ready to go in. Next year, I hope to remember this. As it stood, I had some late-arriving sweet potato starts come in the mail and they took center stage. Slowly the summer raged on. The sweet potatoes showed themselves to be slow growers. One melon, the Tigger variety, held on much longer than the Kansas or the White Cushaw. Every where else in the Left Bed the weeds set up shop. The squishy ones that DH calls “ice plant weeds” and the sprawly ones that remind me of some sea fans. 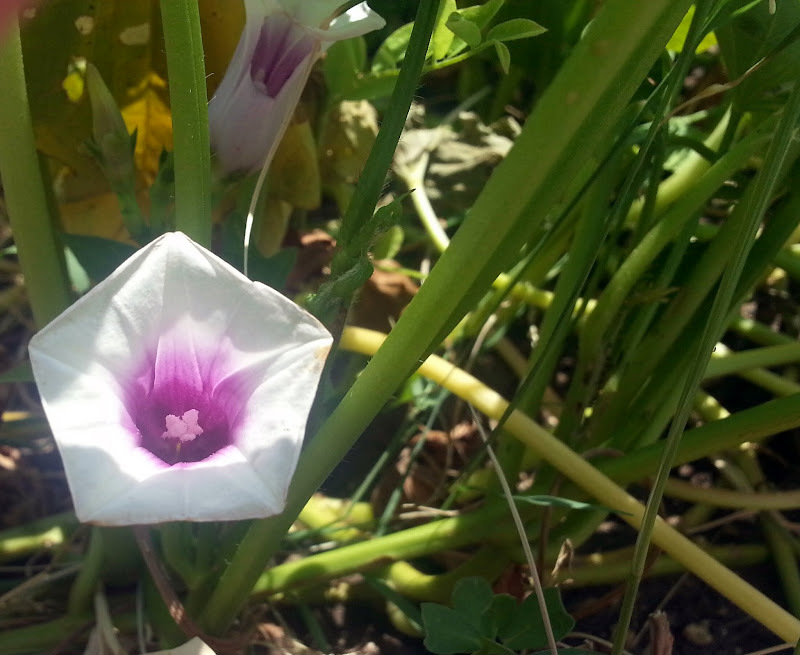 We wonspeak of the wild morning glories or the other ivy. Then there are the two tall types I couldn’t guess at varieties for. Thankfully, having ignored the bed for the last bit of our triple digits, the weeds pulled easily, like they were rooted in sand. The lowlands between the raised beds have served as walkways this season and as such needed a little loosening. I’d added in a couple of inches of leaves this spring to the pathways. Over the course of months of rain and breezy days the leaves went underground. Digging yesterday unearthed them once more. Evidence of a summer spent under damp soil was all around. The leaves had made a layer of decomposed soil-food. Digging through it brought cakes of matted leaf material to the surface only to join forces with new compost and be turned under once again. 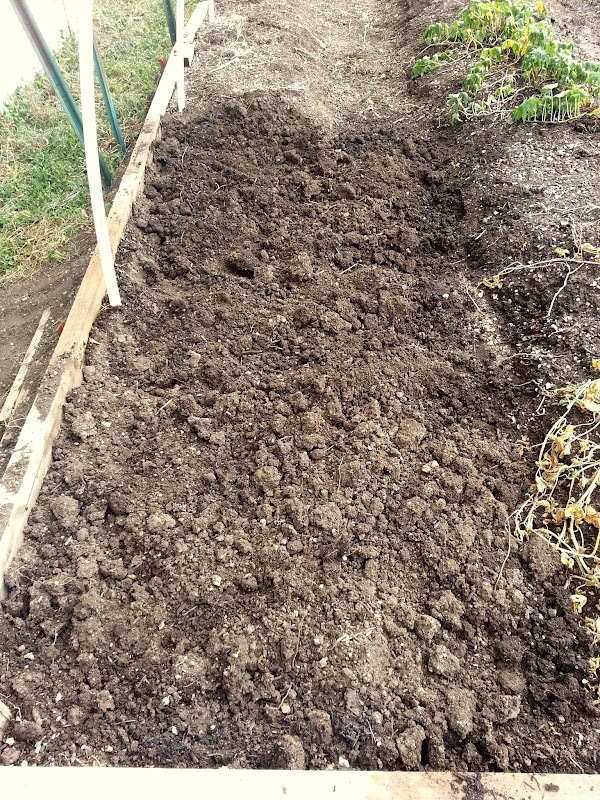 I’m still in the “getting to know you” phase with the soil in this bed. Upon first meeting, it came across as angry and weak . Someone had abused it previously and it showed. 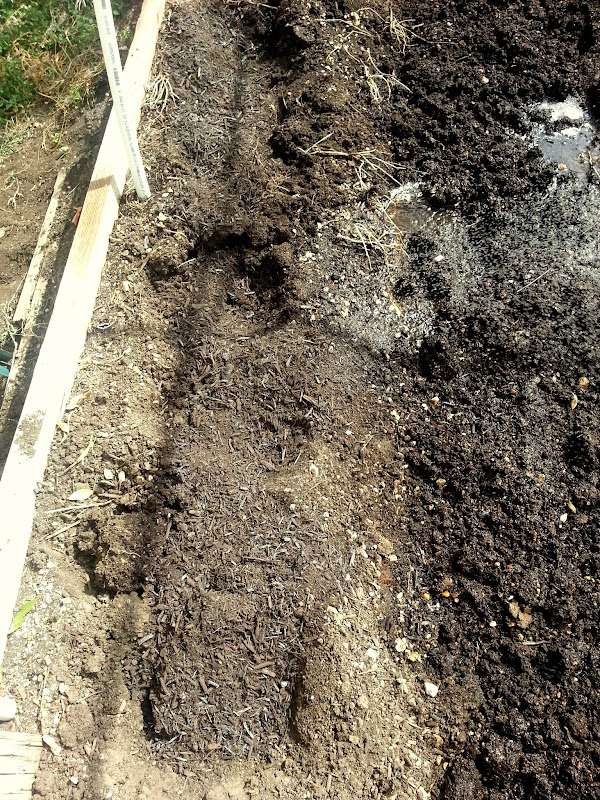 I started the spring by adding organic soil from a local source, manure, and compost. I was in a hurry and didn’t have the time to wait for the county extension office to run any tests. 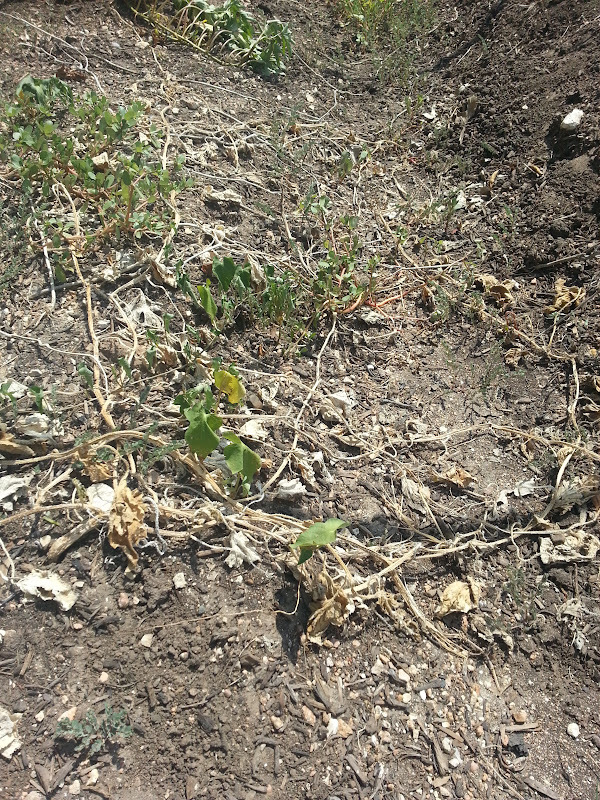 Over the summer I’ve learned that the soil is much sandier than my beds the short two miles to my backyard. It’s also full of tiny pebbles. 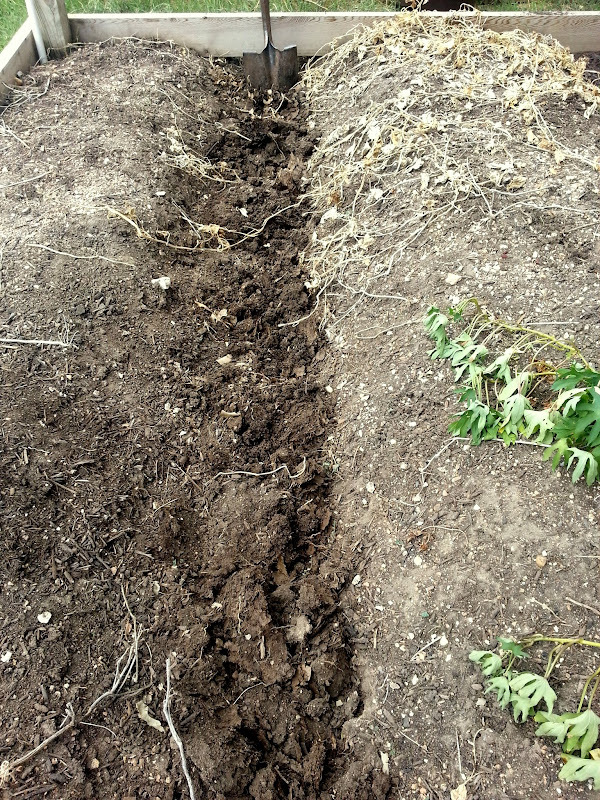 Just below the sandy, pebbly, crumbly soil is what I’m used to working with – thick, cloying, stick-to-your-shovel clay. 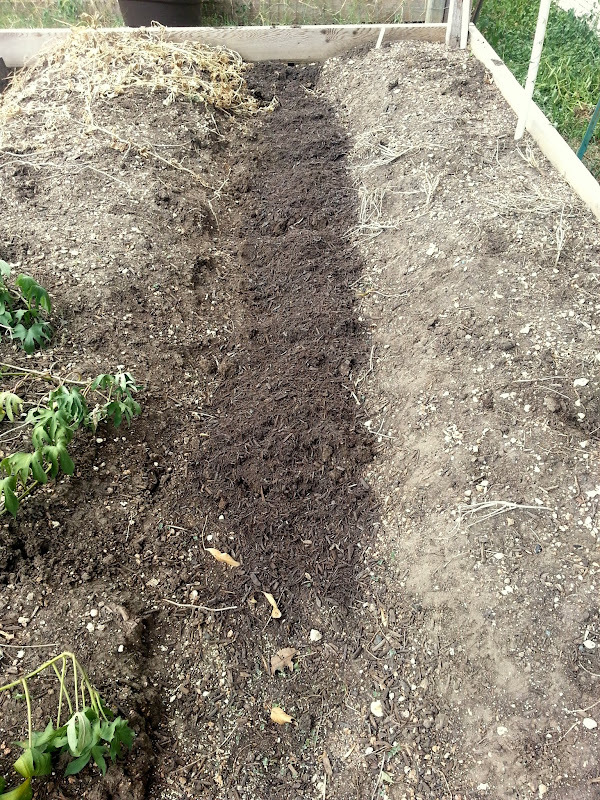 So I worked in even more compost, breaking up clods of dirt (playing at being rocks) along the way. Watering the base layers, burying them, and watering again is my attempt to not irritate the earthworms too much. 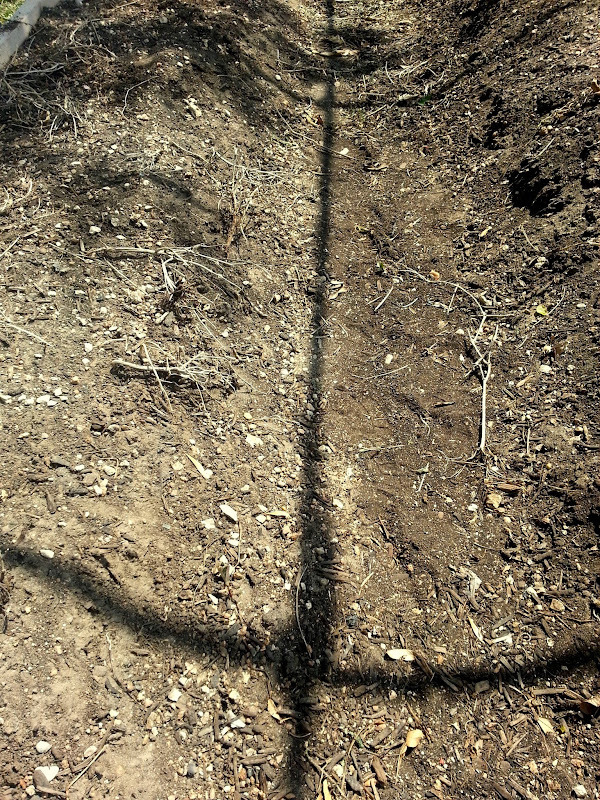 I worked the compost into these holes made by burying the compost in the trenches. Then I worked it all together, evening it out into one bed. Trench be-gone! These beds (this one and it’s twin across the sweet potatoes) are now ready for kale, broccoli, beets, onions, and garlic! Those sad sweet potatoes? Those are the ones I ordered as starts. The pantry-potatoes? They’re happy as can be. How do you prep your soil between seasons?